Since their opening in 2009, Hermitage Brewing Company has grown five-fold in terms of their brewery and operations space at their 7th Street location. 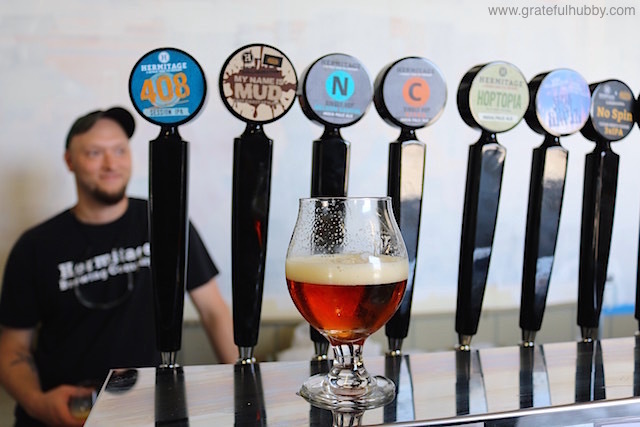 Their growth is a reflection of the growing demand for their beers and their brewing services. Recent beer awards and accolades include the bronze medal for Maltopia Scotch Ale in the Scottish-Style Ale category at the prestigious World Beer Cup held earlier this year, 1st place in the Sour Ale category for Sour Cherry Sour at this year’s California State Fair Commercial Craft Brew Competition and inclusion in this year’s top 50 (out of 247) of Paste Magazine’s popular American IPA blind tasting for Citra Single Hop IPA, coming in at #35. They also have a separate sour beer making facility to release more of their own sour beers, while maintaining their high quality standards. I recently visited Hermitage and toured the facilities with brewmaster Peter Licht and head brewer and cellarmaster Greg Filippi. I also took a bunch of pictures. Click here for the post.